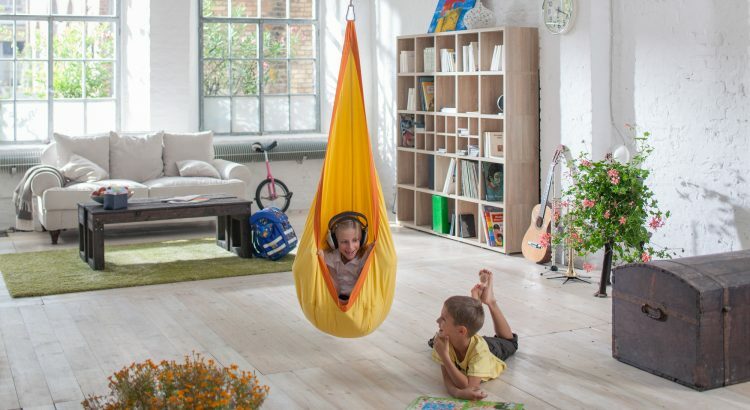 The Hanging Nest “Joki” by La Siesta is a very popular hanging chair model specifically designed for children aged 3-10 years. Available on Amazon in many different colors at the moment, it can be shipped anywhere across North America. “Joki Indoor” Hanging Nest is completely made of organic fuzz-free organic cotton. The other outdoor version-“Joki Outdoor” is designed especially for outside use so you can let it in the garden all summer long. The max weight is 80 kg which is about 175 lbs. The seat has a width of 70 cm (2 ft 4 in) and a total height of 150 cm (4 ft 11 in). It thus offers especially in younger children enough space to completely hide within the “hanging cave”. Being designed for children aged 3- 10 years it is fully adapted to the particular needs of this age group- it is a perfect spot for kids to hide away and unwind. 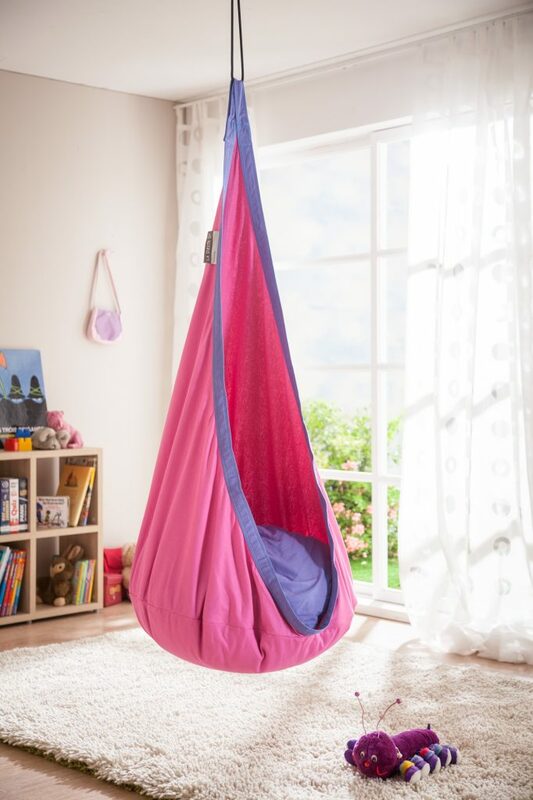 The Joki Hanging Nest takes up a minimum amount of space and even fits into small children’s rooms. The suspension point needs to be at a height of at least 200cm. If the suspension position is higher, it can easily be extended with a rope. 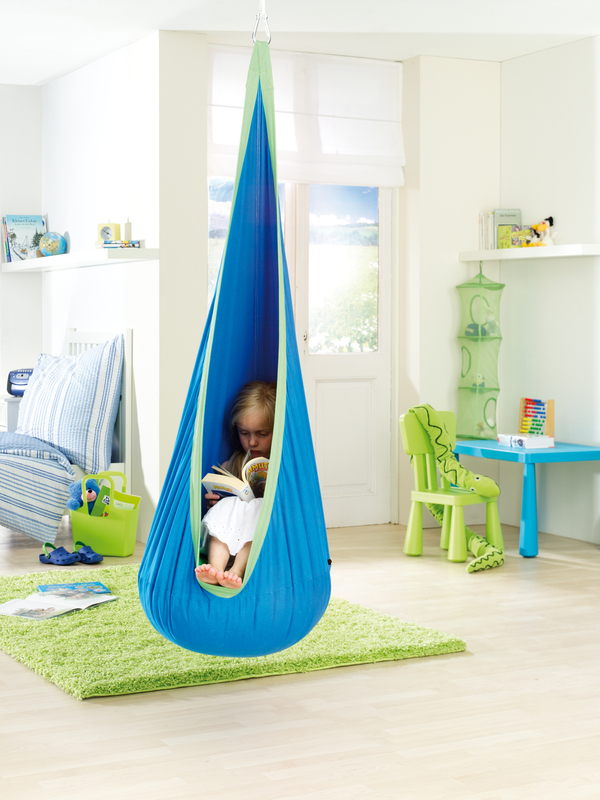 The Hanging Nest by La Siesta is very comfortable and can be used by children as a retreat for reading and dreaming. But the kids can swing in it & on it! Here are 7 solid reasons to hang a hanging nest in your child’s room! It is shipped with a big plushy pillow that you stuff in the bottom and zip close. It goes in and out easily. To prevent children from falling out of the cave, the seat cushion is positioned slightly below the opening in the cave. Nevertheless, some caution should, of course, be taken when playing in a hanging chair. The instructions say not to twist it round and round unless you install a safety swivel for hammocks. This hanging chair is recommended by the Federal Association for posture and exercise (BAG). Hammock Swing for Kids- Fun! Fun! Fun! When buying a product for children, many parents think (not without reason) a lot about the quality and safety of a product. Especially with a hanging chair for kids, which is used not only for sitting in it but also for swinging in it & on it, it is important to ensure high quality of the product. La Siesta’s Hanging Nest is certified by the German Association for Technical Inspection (TÜV) and bears the GS seal for “Tested Safety”. This international quality label is only awarded to products that meet the highest safety standards. The Hanging Cave is available in the different versions and therefore made of different materials. In the standard version, it consists of 100% cotton, the cushion filling is made from 100% polyester. In the version “Planet” the fabric is made from 100% organic cotton, corresponding to the EU Organic Regulation 834/2007. The model “Outdoor” consists of HamacTex®, a special weatherproof woven polypropylene fiber. This feels very similar to cotton, is very durable and dries quickly. The large and comfortable pillow that gets zippered in is removable, so it can be machine-washed: delicate cycle 30°C! Especially for the kids with allergies, this is a very important feature. You can use every of models outside. However, be aware that only Outdoor Joki model can be left outside over the night. The other indoor hanging chair models are sensitive when exposed to constant moisture. Therefore, take the hanging nest down in the evening and bring it inside to protect it from overnight dampness. Keep in mind that a cotton hanging chair that has become damp needs sufficient air circulation to dry. We recommend cleaning and completely drying the hanging nest before the winter season. After it is completely dried, store it in plastic to protect from vermin. For the installation of the Joki, you’ll need a suspension height of 200 cm. If the suspension point is from a higher spot, it can be extended with a rope. The JOKI does not come with the mounting kit- it must be purchased separately. Universal Rope for suspension from walls or ceilings. These items can be found on Amazon and this is our review of suspension systems. The installation of Joki Hanging Nest is easy and you can remove them in one simple step when no longer needed. All hanging chairs and especially hanging nest chairs like this are recommended for occupational therapy for kids with mild autism and sensory processing disorder. In a hanging nest, children find the calm protection they need for playing and dreaming as the nest provides a cocoon-like feel that has a calming and focusing effect which is very important for children on the autism spectrum. It feels like a peaceful oasis. Occupational therapists recommend hanging chairs, hanging nests and pod swings like this. 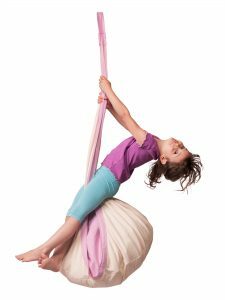 It provides vestibular and proprioceptive sensory input which helps with self-regulation. With a chair like this is easy to observe how much spinning movement your child seeks. And the linear rocking movement forward-and-back is more calming. We recommend adding cushions and blankets inside for added deep pressure input, relaxation, and meditation. The first thing you notice about this hanging nest chair is the quality. Pure high-quality cotton with long fibers is soft to the touch, vibrantly colorful, and long-lasting. The seams are all sewn tightly with no loose ends. Depending on requirements Joki is available in versions made of regular cotton, organic cotton, and from the weatherproof HamacTex®, which is weatherproof and fast-drying and specially designed for its use in hammock chairs by La Siesta. All this make Joki Hanging Nest a brilliant gift for children. They will feel at home crawling into it. Hanging like a cocoon from the ceiling, a tree branch or a beam and is a welcoming oasis for kids to have fun and dream. The Joki kids hanging chair is both- the new favorite toy of your child and a new sheltered spot as the favorite retreat to read, listen to music or just relax. It is not the cheapest in the market, but your child gets the “favorite piece of furniture” for many years- It is worth it. Hanging Nest Joki is made for ages 3 – 10 years. If your child is older, check out a hammock chair. They are sized for older children and adults. It’s rare to find a child who doesn’t like to swing. It’s fun! But the benefits of swinging are more than just having a good time. Swinging and spinning in a hanging chair is like meditation or yoga for children. It enhances body awareness and body control. It is the perfect balance training which helps them improve concentration, focus and alertness.